When the machines in your home go on the fritz, don't just stand around idly waiting for the average repairman to show up; call Captain Appliance. Our mission is to provide fast, reliable and affordable appliance repair services, and we have established ourselves as a leader in the industry in pursuit of that goal. Our repair technicians are all factory trained to repair and restore most major brands of appliances and are experienced in working an all types of household machines. Whether it's your washer, dryer, fridge, freezer, stove or garbage disposal, Captain Appliance can have it up and running again for you in no time. We are fully licensed and insured and offer fair rates on every job. 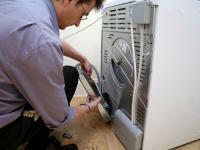 At Captain Appliance, we stand by our quotes and will never tack on any hidden fees or extras mid-job.